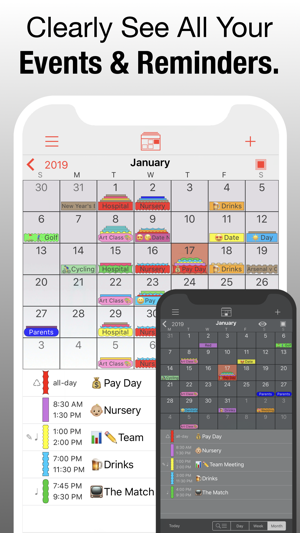 Searching for the best rated calendar app? 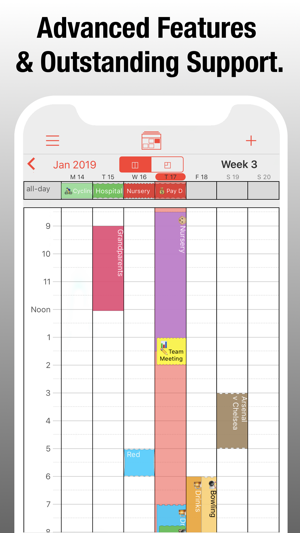 PocketLife has been specifically designed to be stylish, intuitive and super-easy to use. 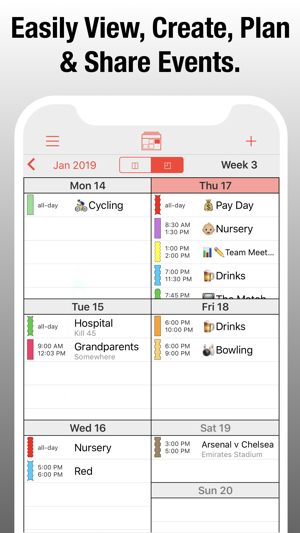 Powerful, functional and completely customisable, so you can truly make it your calendar. 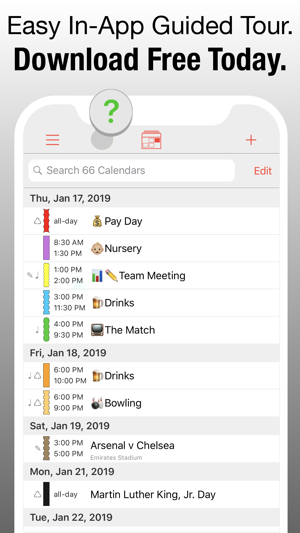 With a ton of useful modern features, you will find PocketLife an essential tool for organising your life. 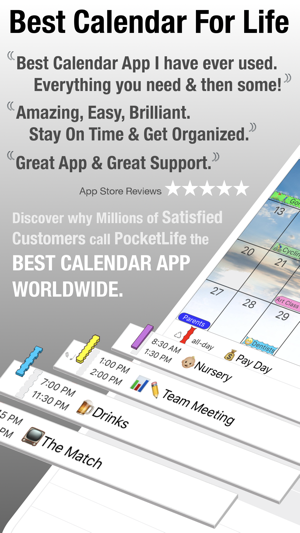 PocketLife will quickly become your most used and indispensable app. 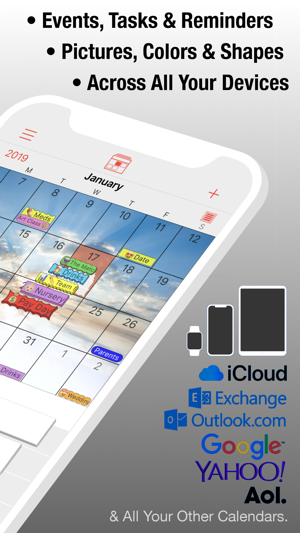 * Easily SHARE CALENDARS with your FRIENDS & FAMILY. * Create Events using Natural Language. * Universal app: iPhone, iPad, iPad mini, iPad Pro. * List, Day, Week, Agenda, Year and 3 Month views. * AirDrop & AirPrint support. You need to go into the Calendars section in the main device Settings app and then set 'Sync' to 'All Events'. 1. Limited events. When you first get the app, it’s great and all but then after a couple of events you have scheduled, it kind of goes down hill, if your a twelve year old who doesn’t like to spend money on things like this or just someone who doesn’t like to throw money out the window. You have to pay $5 in order to get unlimited events and I know that’s not a lot or much of a problem but it’s very unnecessary. 2. Adds. They don’t just pop up on the screen, (which I am very fond of, thank you) instead they stay at the bottom of the screen. I don’t mind this, but the problem is is that some can be a little inappropriate, scary, or disturbing. For instance, if you have heard of the app Yarn, the add is on the bottom of the screen. I’m not going to go into details about this add because it is all of the above: inappropriate, scary, and disturbing. Try the latest version of the app for Free Today. You can then purchase the in-app Upgrade to remove the adverts. 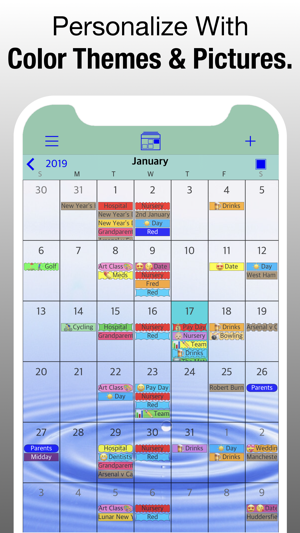 Love that it links w other calendars (though I'd prefer to mesh them all together onto one grand calendar), love that it's linked w my reminders, and the alerts AND the alerts based on location/drive time!! (though could use more options for the audible alerts) love the layout-that I can see a portion of what I wrote w the color I chose on each day instead of a simple dot that doesn't mean anything without clicking it... don't like that I have to keep paying for it over and over every year but like it so much I keep doing just that. 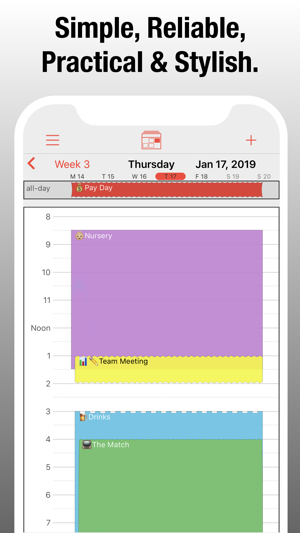 Recently figured out how to view my calendar on my iPad- and share it between the two devices- so I can be on the phone and adjusting the iPad calendar at the same time. Main thing I would change: when you have 2 events for the same day, be able to choose which one goes on top! To prioritize the at a glance display. I’d rather know at a glance I have a doctors appt that day over knowing it’s my lil icon indicating it’s a pay day.. as even tho I try to do things w different colors, inevitably the more important one defaults to the bottom layer and I miss things.. easy to click and view but not so much at a glance to see that little border.. Here are my thoughts in no particular order that you, the reader, may find intriguing. I always view how many updates are released and how far apart/how recent they occur (See link in app page). These folks update regularly over the years and you would be surprised how many do not. GUI is excellent, feature rich, capable, fantastic team of designers & devs. Subscription fee models allow companies to be valued higher, operate more stable and be more profitable. More and more companies have shifted to this model across all industries in the past 10 years. Kudos to the dev responding to every review consistently and logically. 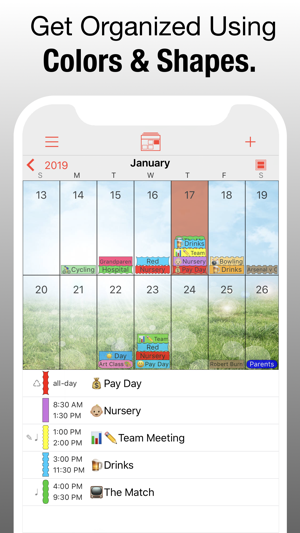 However, with a company such as Readdle (another high quality dev team) offering very, very solid apps into many spaces, it’s hard not to go with “Calendars 5” and pay the one-time charge for a full featured, fully unlocked app that does not charge you again except the initial cost. OvalKey LTD obviously is a very talented team and they are very forthcoming about their business model. If you want to use the best, you have to play by their rules....or go pay about $5 to Readdle and forget about it and use their high end apps for another 15 years. Thanks for your feedback and taking time to support the app. 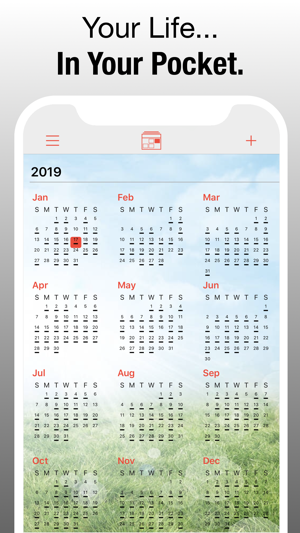 It is not a monthly subscription that the app works with, it is Yearly. We genuinely want our users to feel they get great value for money for an app they love and know they can rely on long term. Our focus is primarily on our Current Users and them loving the app and wanting to continue using it, not relying on obtaining new users. We think that makes sense. Like you state more and more companies are shifting their business models to ones that are sustainable long term and not just short term cash grabs for novelty apps or gimmicky games apps. If you have any further feedback, comments, feature requests then please contact our Support Team through the in-app link on the app’s ”Main Menu" > "Help & Support" page.